I think I wrote one "empties" post last year but I've decided to blog more regularly about the products I've been using up. Hopefully it will actually encourage me to use up more products as I have a tendency to keep buying products when I have stuff left! 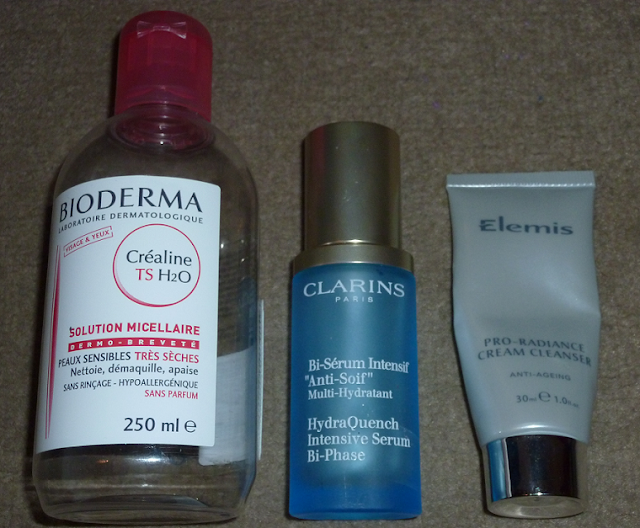 I always use up a lot more skincare, body and hair products than makeup as you can see from my photos! I bought some of the Christmas products from Lush back in October including this small bottle of Ponche shower gel. I was attracted to the refreshing orange scent as it seemed like it would be a nice product to use in the mornings to wake myself up for work! This shower gel contains tequila and I ended up using this product one hungover morning and put myself right off it! I couldn't really use it after that without feeling queasy so I gave it to my fiance when he'd ran out of his usual shower gel. The next two shower gels, Philosophy Sweet Talk and Origins Ginger Burst were purchased during the Boxing Day sales as I got them at bargain prices. Philosophy Sweet Talk is a gorgeous, girly pink, thick gel that can be used as a shampoo, shower gel or bubble bath. I only ever used it as a shower gel but you only need to use a little to create lots of lather and it smells like sweets! I really enjoyed using this but I think this particular scent was limited edition and I don't really like having the full size versions of the shower gels as I get bored easily and start wanting to buy others for some variety! The Origins Ginger Burst had such a beautiful scent. It was a mixture of ginger and citrus. 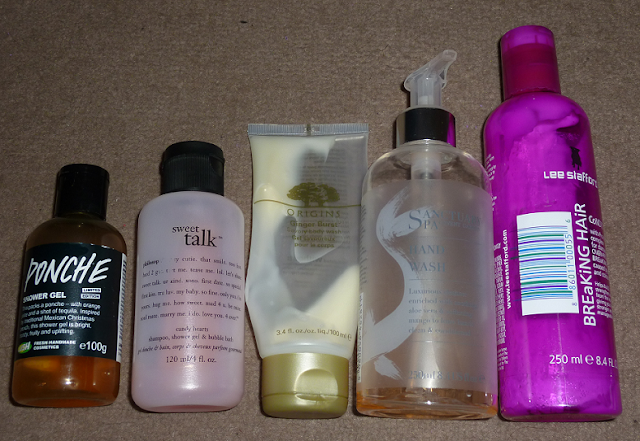 The shower gel didn't produce a lot of lather but I think that is probably due to the product being free from lots of nasties such as parabens. I still felt lovely and clean after using the product but I won't be paying £18 for a full 200ml size as it's quite a lot to pay for a product that would only last me about 2 weeks! I picked up the Sanctuary Hand Wash along with some gifts I bought at Boots on 3 for 2 and I'm glad I did as I really liked it. It has that classic scent you get with their other products that come in the orange packaging. After using this I often wondered what the nice smell was around me and then realised it was my hand wash! At just over £4, it's more expensive than your regular hand washes but it contains mango and aloe vera to stop your hands from drying out. It was quite a thick, moisturising gel which I enjoyed using. I would definitely repurchase this. I love it when Boots have Lee Stafford products on offer such as 3 for £12 as I often make a few purchases! The Breaking Hair Conditioner was one of the products I bought last time but it's the only one I've used up so far. I'm not sure if this helped stop my hair from breaking to be honest as I think I wash my hair too often which makes the problem worse! This conditioner was quite thick and I felt like it did a great job at putting moisture into my hair which helped with reducing tangles. I absolutely love the scent of Lee Stafford products too! My fiance always comments on how nice my hair smells when I use them. I will probably repurchase this product next time it's on offer as I have quite a few products in my stash at the moment! Bioderma Crealine Solution Micellaire is one of those holy grail products a lot of bloggers seem to love so I just had to pick some up when I went to Paris last year. I don't wear foundation on a regular basis so I pretty much only used this as an eye make up remover. Although when I did try it for removing foundation, I used about 5 cotton pads worth and my face still felt dirty! I don't rate it much as an eye make up remover either. It felt like you had to rub quite hard and I still had slight panda eyes after using this. I was forever wishing the bottle would end as I didn't want to waste it since it's quite expensive! I've recently been able to go back to No7 Eye Make Up Remover and I felt so relieved as it's so much better. The Clarins HydraQuench Intensive Serum is a product I enjoyed using last year. I used it as a day serum before applying moisturiser and it did a great job at hydrating my skin, leaving it with a silky smooth finish. Its quite a light, thin product that feels like a mixture of water and oil rather than a serum like Estee Lauder Advanced Night Repair. This was £40 but it lasted me around 7 months using it every morning so I think that's pretty good. I'm not sure if I'll repurchase item simply because I love trying lots of different skincare and I have a new Origins serum that I've just started but I would definitely recommend this product as I think it's fab. I won this sample size of the Elemis Pro-Radiance Cream Cleanser from a giveaway on Beauty in the Mirror but I've used it before and I forgot how much I loved it. Its like the Liz Earle Cleanse & Polish in the way that you apply it to a dry face and remove with a hot, damp cloth but I think this one is so much better. I was actually using the Liz Earle one just before I went back to this and I thought Liz Earle was good but I instantly noticed the difference when I went back to Elemis. It's so thick, creamy and luxurious and leaves your skin so soft and moisturised. It helped clear up some spots I had and along with an Elemis toner I started using, I noticed my moisturiser sunk in a lot better. I'm already using a full size bottle of this as I asked for a set with it in for Christmas. This is super expensive at £29 for 150ml but I really think it's the best cleanser I've ever tried. L'Oreal Volume Million Lashes Excess mascara has been mentioned a lot on my blog and it was my favourite product of 2012! It's the best mascara I've ever tried and if you want to read my review click here. I would definitely repurchase this as I love, love, love it! Another L'Oreal product that I love is the Lumi Magique concealer pen. I didn't love it at first and stopped using it but when I went back to it I realised how great it was. It did a great job of lightening my under eye area and concealing some of the darkness. It didn't completely cover my dark circles but I think it's one of the better concealers I've tried. It blends in nicely and doesn't crease after wearing it for hours. I tried to repurchase this over Christmas but my local Boots had ran out of the light shade unfortunately. There was a great free gift that I could have had for spending over £15 as well but I missed out as I was waiting for the concealer to come back in stock! 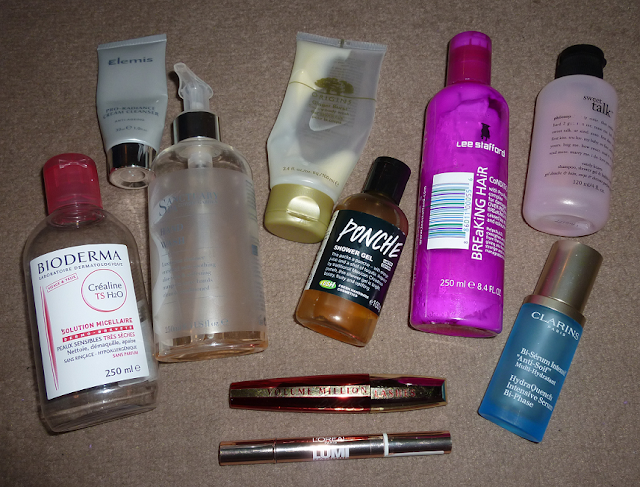 Hope you enjoyed reading about my empties :) Next time I've collected a decent amount of empty products I'll do another post. Link me up to your empties posts so I can see your thoughts on what you've been using up. Also let me know if you've discovered any great products lately or if there is something you wish you hadn't bought! I love these kinds of posts - I am gonna try that serum! Thank you! Well done on using up all these products I really need to make an effort to finish more of mine! Always amazes me when girls do these type of posts as im the sort of girl that just never seems to finish anything off..much to the annoyance of my other half!! Ah you should give them a go :) I've seen some full sized Christmas ones in Boots for £7.00!